The inside arc tube of quartz allows more ultraviolet light to be transmitted towards the inner phosphor coating of the outer bulb. This has the effect of increasing the light output and improving colour rendering properties. The outer bulb is filled with nitrogen, or nitrogen/argon gas mixture, and maintains an even lamp temperature. 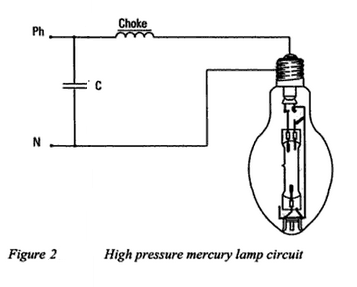 Figure 1 shows the circuit for the high pressure mercury lamp. To commence the discharge, a starting electrode is located close to the main lamp electrode. When the supply is first switched on a small discharge takes place in the argon gas between these two electrodes, the current being limited by the high resistance (10 Ωk to 30 Ωk) in series with starting electrode. This discharge is now transmitted in the argon gas between the two main electrodes, causing an increase in temperature and mercury vaporization. 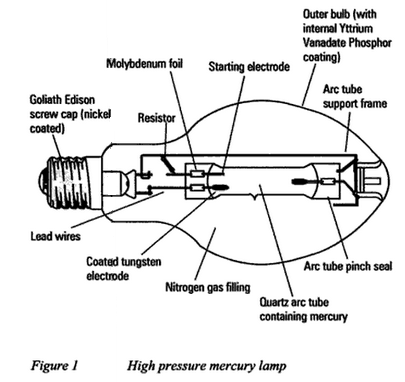 Lamp pressure builds up and maximum lamp brilliance is attained when all the mercury is vaporized. The chock limits the current flowing though the lamp and the capacitor is incorporated to improve the power factor.
. applications – used where colour rendering is not of major importance, for example street lighting, car parks, floodlighting of buildings, general outdoor commercial and industrial uses.